We’re the Mageia community, and we are very happy to announce the release of Mageia 2! We’ve had a great time building our community and our new release, and we hope you enjoy using it as much as we enjoyed making it. You can get started right now – see what’s available, choose your version and download it from http://www.mageia.org/2/. What’s new in Mageia 2? Mageia 2 is a completely new release; you can check the Release Notes to learn more about what’s inside. Why would you choose Mageia? Mageia 2 is built from the best Free and Open Source software with a constantly expanding choice of apps – there is something for everyone’s taste. For more information, check the Release Notes for the complete list. Mageia is a community as well as a distribution. This means that you can be part of the teams putting your distro together; your voice is welcome as we work out where Mageia is going and how we’re getting there. We’re a community distribution and we’re very happy for companies to be part of our community. We’ll even credit you! Join us – be part of making your software the way you want it. Mageia’s bug reporting system is open to everyone, as are the mailing lists and community support, making it easier for you to have your voice heard and follow what is happening – and you don’t need to subscribe or pay to have access to the fully tested and prompt security updates. This entry was posted in Mageia, release and tagged release. Bookmark the permalink. just a note, the date written in the download link (at the home page) is wrongly written as 12 may..
sorry, neglect my comment about the date! A wonderful and very successful work. Cada día van mejorando más, Felicitaciones!! The KDE preview looks charming, congratulations for the release! :). I have been testing/upgrading Mageia 2 since beta 3. It has been very solid. Question, how long will Mageia 2 be supported? Release cycle is nominally 9 months, with a support cycle of 18 months. For more info see here: https://wiki.mageia.org/en/Rapport_moral_2011. The info is in the Packagers Team section. Good news! Happy downloading and upgrading guys! Pingback: noticiasDrake » Blog Archive » ¡Mageia 2 esta aquí! Lha iki ra sing tak enteni..
wis njedul… langsung download ! Great Stuff! Will try this out! Gr8! 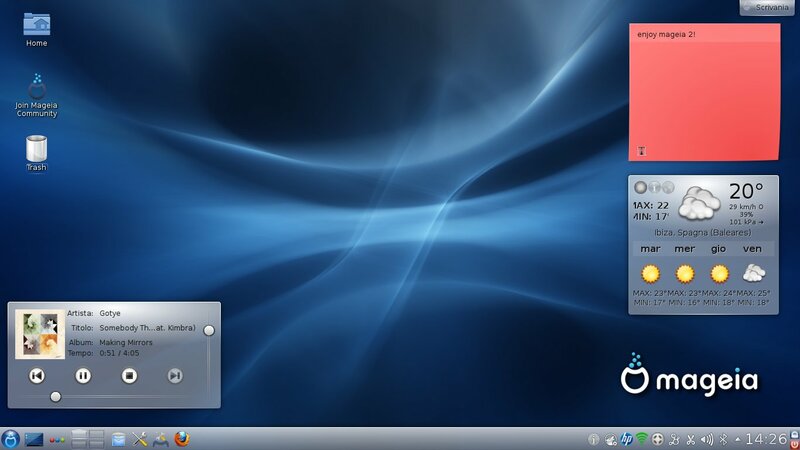 I thinks i should replace Ubuntu 12.04 by Mageia 2. Yahooooooooooooo!!!! Proud of the team – great job! I’m disappointed, I wanted to see nouveau by default and also KDE 4.8.3. Why include Firefox 10 when Firefox 13 is about to get out? It’s just around the corner. Please don’t tell me “stability” because I use KDE 4.8.3 and Firefox 122 in archlinux every day and it’s more stable than previous versions. Not trying to say Mageia is bad, it’s pretty good, but it can be better. Because we are using Firefox Extended Support Release. ESR – it’s a good choice, I’m using it at work 🙂 Stability is far more important than some minor features. And also a lot less work for security updates, and QA. KDE 4.8.3 FIXED SOME STABILITY ISSUES THAT WERE IN 4.8.2. Excellent work. One of the best if not absolutely the best of all the Linux distros. Congratulations. KDE 4.8.2 is not the current release, the current release is 4.8.3 which fixed a nasty bug for kmix, please provide an easy way to upgrade. gran trabajo! a mi me funciona mucho mejor que Mint, Ubuntu, etc. si tengo instalada la RC ya me vale? tengo que volver a instalar? “Great job! Works better for me than Mint, Ubuntu etc. No, just update the RC now, then delete the Cauldron repos and add the Mga2 ones. Congratulations on the new release. I will try it today and am sure I will like it. I hope mageia 3 wwill switch to grub 3. Congratulations on the new release. I will try it today and am sure I will like it. I hope mageia 3 wwill switch to grub 2. Not me, glad you guys held back there….Any plans to put KDE 4.8.3 on the testing repo? Congratulations to the team, and thank you for an excellent release. The KDE edition looks very good, and I know that I will enjoy using it. Thanks a lot for your work!!! Super!!! I just replaced Ubuntu 12.04 LTS and Linux Mint 13 maya (LTS) with Mageia 2. Will I have an LTS for Mageia 2? or Can i just upgrade when Mageia 3 comes? I wanna have a stable system not to uninstall, install and reinstall distros. Excellent distro though… Go for Mageia 2! QA team’s work is not hard but needs some time, we test every update candidate to the stable releases, security fixes, etc., so the more people we are, the more likely it is that we can have a LTS version! Congratulations. I wonder now that Mandriva is moving to a community distribution rather than corporate-owned if Mageia and Mandriva will merge. It seems like a good idea to me, less duplication of effort. But I haven’t used Mandriva for a few years and don’t really see the point for myself. I’m comfortable with apt and Ubuntu just released a version that will be supported for 5 years on the desktop, upgrading every 18 months is a PITA (I’d rather see a new Mageia version every year supported for 2+ years). See previous post, http://blog.mageia.org/en/2012/05/21/mageia-comes-full-circle/. Mageia will not merge with Mandriva and will remain a full community distribution. i love this distro! got it on 3 computers and it runs great.. everything works and no broadcom wireless issues.. thats usually a hit or miss with some linux distros ..thank you so much mageia, for the free time you guys put into a great distro.. we appreciate it alot. what music player widget is that?